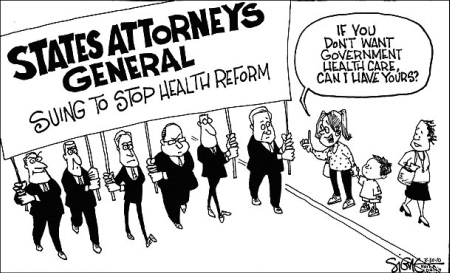 If you haven't yet read it, click here to read the story about the cartoon published by The New York Post today. 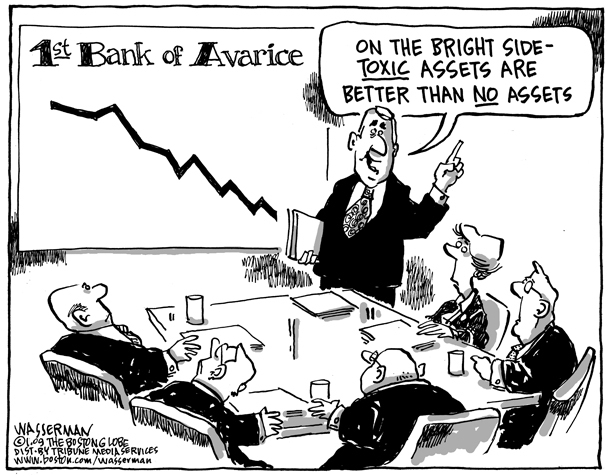 The cartoon, seen below, has become a major controversy, not only nationally, but internationally. Thanks to the right-wing owned Post (Rupert Murdoch), America is looking like a less than decent place to live. A place where the 44th president is in fact, depicted as a very dead and rabid chimpanzee. 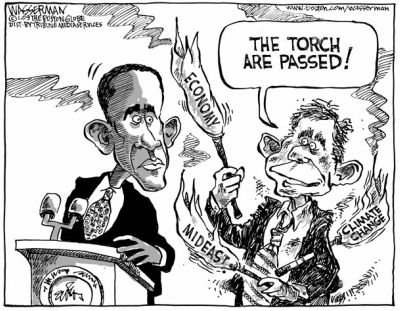 On the Huffington Post, Sam Stein reports that in the actual newspaper today, the cartoon page was preceded by a page with an image of President Obama signing the stimulus bill, as seen below. 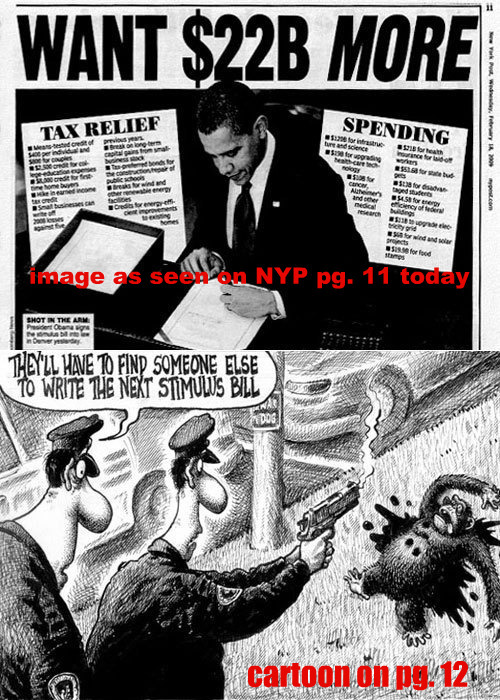 In the page preceding a New York Post cartoon that depicts drafters of the stimulus legislation as a gun-downed chimpanzee, the paper published a large photo of Barack Obama signing that very piece of legislation. And according to The New York Times, a newsroom employee at the Post reported a major backlash via telephone. The employee also indicated that many Post staff members were themselves upset. NO it does not imply violence against any elected official. It's just a cartoon. Mr. Delonas has free speech rights. 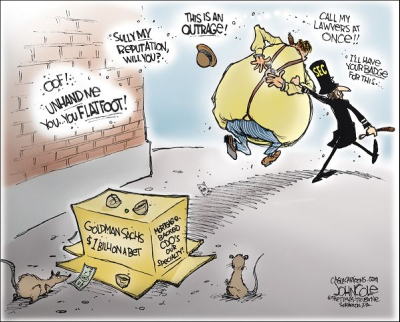 His cartoon makes a critical assessment of the frenzied politics that gave us the Obama stimulus/fraud package. There is no racism in this cartoon. Get over it people. It's a cartoon. Oh please, darlin', let's just briefly examine the 'parody' parallel. According to the NY Post Editor in Chief, "It was a clear parody of..."
So, a chimp on Xanax, in an unprovoked attack, almost kills a woman and has to be shot and killed by police = legislators and/or the President writing the stimulus legislation. Yeah! I get it! That's a REAL KNEE-SLAPPER! I bet the woman who had her face ripped off by the chimp might have a thing or two to say about that! And hey, that doesn't even address the issue of how black Americans have traditionally been portrayed as apes or ape-like in political cartoons for too damn many years. This sort of transparent racist ugliness is just another disgusting addition to a series dating back to the days of slavery in America. Furthermore, and most importantly, the depiction of violence perpetrated on a rabid chimpanzee equated with either the President or with our legislators, is completely sick and inappropriate, and has not got a damn thing to do with free speech! Remember "incitement to violence"? For Update No. 1, click here. :: The cartoon depicts a dead and bleeding chimp, shot by two policemen. It is purportedly referring to the incident in Connecticut, where a pet chimp attacked a woman, and was subsequently killed by authorities. However, it has overt racial implications, and implies violence against the president. It is completely disgusting so far as I am concerned, and the Post should be held responsible for attempting to incite violence against the president. The cartoon in today's New York Post is troubling at best given the historic racist attacks of African-Americans as being synonymous with monkeys. 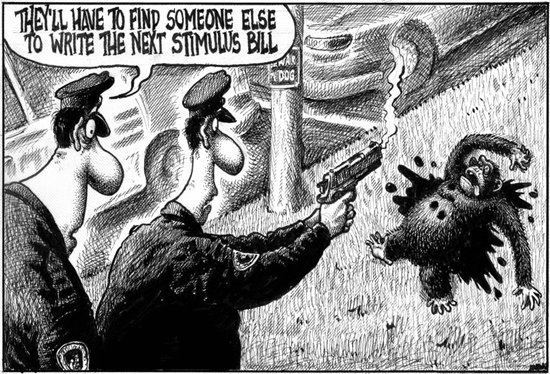 One has to question whether the cartoonist is making a less than casual reference to this when in the cartoon they have police saying after shooting a chimpanzee that "Now they will have to find someone else to write the stimulus bill.Being that the stimulus bill has been the first legislative victory of President Barack Obama (the first African American president) and has become synonymous with him it is not a reach to wonder are they inferring that a monkey wrote the last bill? The cartoon is a clear parody of a current news event, to wit the shooting of a violent chimpanzee in Connecticut. It broadly mocks Washington's efforts to revive the economy. Again, Al Sharpton reveals himself as nothing more than a publicity opportunist. What do you think about the intent of the Post? 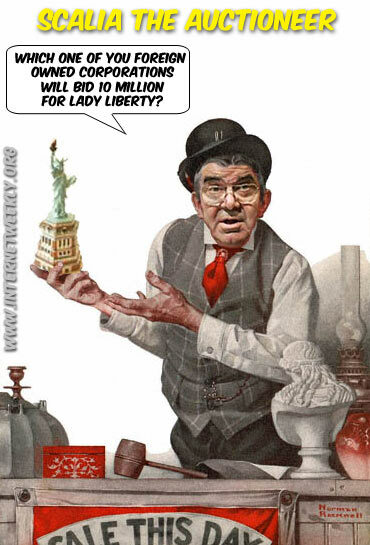 :: IPD Daily Political Cartoon Find. :: Update on the Coleman-Franken senate race. 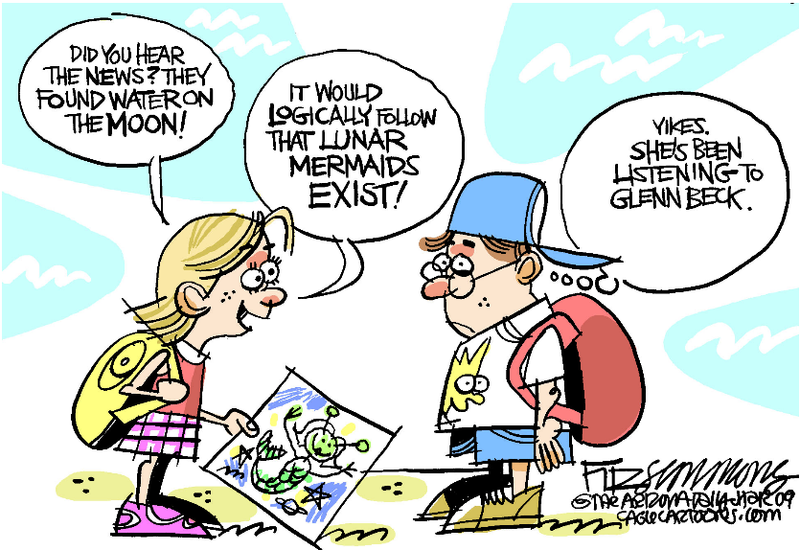 :: IPD Daily Cartoon Find.